Please send your member news, events, articles of interest to chicagowca@gmail.com for inclusion in the December newsletter! Deadline for submissions is Sunday, November 30, 5pm. 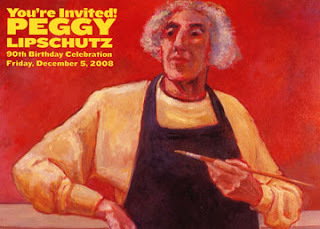 Please join us in celebrating Peggy's 90th birthday and the screening of the film: "Never Turning Back, The World of Peggy Lipschutz". First we will have a concert with Rebecca Armstrong, Kristin Lems, Mark Dvorak, Jaime O'Reilly, and a special appearance of the Young Stracke All-Stars. A discussion with Producer/Director Jerri Zbiral and Editor Sharon Karp will follow the film screening. A mini retrospective of Peggy's paintings, with a reception (and birthday cake), will take place at the Harris Gallery later in the evening. Please feel free to call/email me should you have any questions. This will be an informational/ exhibit planning meeting, Saturday at MCAD, Minneapolis College of Art and Design, 10am - noon, in classroom 410. Meeting will be focused on the Women and Water Rights, Ripples of Regeneration Exhibit at the Nash Gallery, U of MN, 2010. Women and Water Rights, Ripples of Regeneration is a regional and international art exhibition scheduled to be shown from February 23 to March 25, 2010, in the Nash Gallery on the Twin City campus of the University of Minnesota. By showcasing invited international artists from many parts of the world, a global mail art/postcard show, as well as a juried selection (women or women/men collaboration) from the State of Minnesota, the exhibit will examine the centuries-old intimate connectedness between women and water in its daily use, in cultural traditions and in the spiritual realm. At the same time, through accompanying programs featuring lectures, panel discussions, videos and interactive activities the exhibit intends to draw public attention to the current and future global water crises as seen from a gender perspective. Join us for an Open House that includes our neighbor Starshaped Press. Starshaped Press is a wonderful place to get your special holiday cards and invitations, they do letterpress printing the "old fashioned way", with antique printing presses and metal type. Stop by have a drink, let us know what you have been doing and we will show you what we have been up to. 4F Design Holiday Celebration to benefit The women's Treatment Center. This year we will donate 10% of all December sales to The Women's Treatment Center, www.womenstreatmentcenter.org, a Chicago facility that helps both women and their children. "The Women's Treatment Center has become a national model for providing treatment and support services to women and children in a community based setting." 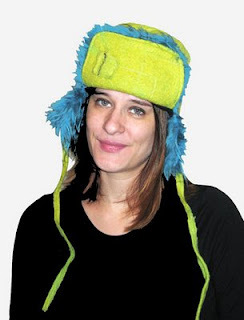 Check out our kids clothing and our expanded selection of extra warm Wool and Faux Fur Flap hats (above).